Won European Actor (Javier Bardem) and European Director (Alejandro Amenábar) and was nominated for European Film, European Screenwriter (Alejandro Amenábar/Mateo Gil) and European Cinematographer (Javier Aguirre Sarobe), European Film Awards 2004. Alejandro Amenábar (The Others (2001), Agora (2009)) took on the daunting challenge of the life story of Spaniard Ramón Sampedro (Javier Bardem), a former sailor who was tetraplegic for 28 years, and who successfully fought in court for his right to euthanasia. Ramón gets to know the lawyer who is defending his cause and who has a degenerative fatal disease herself, Julia (Belén Rueda), and also becomes close to Rosa (Lola Dueñas), a lonely social worker who has been abused by the men in her life and who tries to convince him that life is still worth living. Through Ramón's love, the two women are inspired to accomplish what they previously never thought possible and, despite his wanting to die, Ramón nevertheless taught everyone he encountered the meaning and preciousness of life. An uncanny ability to move others, though he could not move himself. As written by Amenábar and Mateo Gil, and performed by Bardem and Co., this never once sinks into the maudlin morrass that could so easily have resulted from such an emotive story - rather, we are presented with a firebrand who, while not selfish, nevertheless demands that his right to choose must, by its very definition, outweigh the pain that he knows he will cause others when he leaves life. 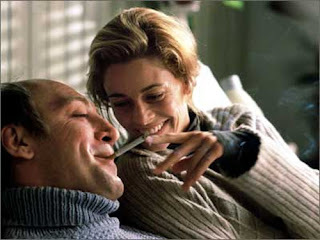 And there is life-affirming joy here, too, helped enormously by Bardem's biting, caustic but always witty performance - the scene in which he argues with another tetraplegic (a priest, Padre Francisco (José María Pou)), who's trying to convince him that all life is sacred, is both profane and paralyzingly funny. And perhaps the film's greatest achievement is the conviction with which it leaves the viewer - you're sad to see Ramón go, no question, but you know that this way, at least his life and death had meaning. What more could any of us ask? 125 mins. In Spanish, Catalan and Galician.